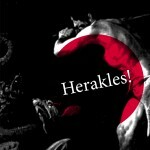 ARCO present a special live preview performance broadcast of Neil Luck’s Herakles! It explores the myth of Hercules, retold through wild allegorical misinterpretations, mistranslations and miscreancy. Written and directed by Neil Luck, Herakles! is music theatre gone awry; a cultural black-hole drawing-in and distending ancient and modern embodiments of the Greek demi-god. A tasteful fusion of Apollodorus, Schwarzenegger, Terayama, Hendrix, Disney, Arcane British Folk Rituals and Aragoto-style Kabuki plays. Performed by ARCO. Herakles! 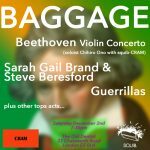 features as part of Tête à Tête Opera Festival, King’s Place, on Saturday 9 August at 8pm and Sunday 10 August at 4pm; and at Milton Keynes Art Gallery on 11 October at 7.30pm. This entry was posted on Sunday, October 5th, 2014 at 3:10 pm	and is filed under Adam de la Cour, ARCO, Benedict Taylor, Documentation, Neil Luck, News, Tom Jackson. You can follow any responses to this entry through the RSS 2.0 feed.